Even though your copper cookware won't wear out, it's lined with tin and that does have a shelf life. For nearly 100 years, Atlantic Retinning and Metal Refinishing, originally on West 26th, now in Oakhurst, New Jersey, has been specializing in making your copper cookware worthy of handing down to the next generation… Looking to buy new? Check out Brooklyn Copper Cookware. Han Solo found buried in carbonite on Mercury. Jean Silversmiths, 16 W. 45th [5th/6th] 212.575.0723, has been around since 1910, silver central in these parts for repairs, scratch and dent removal, polish, and restoration. The NY Brass Quintet was formed in 1954 and performed to worldwide acclaim until 1984. Read their bio here. Zinc is just one of the many metals that Wainlands has been working with for over four decades, fabricating all kinds of metal parts. 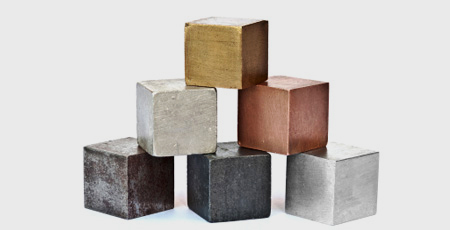 They also work in brass, bronze, stainless steel, aluminum, both hot- and cold-rolled steel, copper, and pewter, all in seemingly unlimited finishes. They used to be on West 17th; now they're in Astoria. Contact them through the website or at 718.626.2233.